January 2018 – Behavior Matters! Back in September, I partnered with Tim Houlihan to start “a monthly gathering of curious minds” which we called Behavioral Grooves. We thought it would be interesting to get like-minded people together to talk about applying behavioral science to life and work. We announced the meetup and were hoping to get at least a few of the friends that we had contacted to show up. We ended up with 24 people for that first session where we talked about habits – how they are formed and what people can do to improve them. From there, it took off. We have over 180 members signed up to our meetup group and it is growing fast. We have had three monthly sessions as of early January 2018 and our fourth is lined up for two weeks from today. We have over 20 people who have made it to two or more of the sessions. I guess we struck a nerve. For our second session, we invited Professor James Heyman to speak and thought, hey, since he’s here, why don’t we interview him and make a podcast out of it. Thus, our Behavioral Grooves podcast was born. Tim and I both loved that so much that we decided that we didn’t want to wait for the next Behavioral Grooves session to record our next one – so we started to invite people and interview them – both live and over the internet. To date, we have seven interviews recorded and three more in the works. 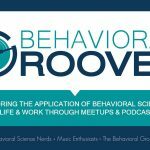 These podcasts mirror the Behavioral Grooves sessions in that they are conversational in nature where we geek out over behavioral science and how we can apply behavioral science insights into our daily work and lives. They have been a blast! In reflecting on this, it appears to me that these two outlets provide us with a way of both learning and sharing. We want to be advocates for good, ethical use of behavioral science. We believe that there is much to learn and we can improve our work and lives by understanding and by applying these principles in a thoughtful and deliberate manner. We also realized that we love the community that this is creating. A community of curious minds who are interested in science and the application of that science. A community of people that we can bounce ideas off of. A community of people that can push us to think about things from new perspectives. This is ultimately what we have been building and hope that it grows and provides a place and outlet for others, as well as ourselves. If you are ever in Minneapolis on the third Thursday of the month – please come and join us at our meetup (find out more info here) and if you can’t make that, please listen in to our podcasts (click here to find the latest). Come and join our community of curious minds!